After what has to be described as the CRAZIEST YEAR EVER I am hoping to be back on Bento track. For those of you who did not know, I changed jobs this year, and started teaching Drama…. I have described this as catapulting from one chaotic moment to the next, hurtling towards the next performance. It has been terrific! We won the Regional Shakespeare Competition and went to Nationals, we won Theatresports for the first time in 19 years of the competition, we put on shows, went on tour doing 6 shows in 2 days, learnt Circus tricks, and now are in the middle of doing school holiday programmes and preparing to present “The Wizard of Oz” in 2 weeks time. The learning curve is huge, but fantastic. Or frantastic. And in the middle, I broke my ankle in a major way (3 breaks, 1 dislocated foot, 1 severed ligament, 1 operation, 1 titanium rod, 8 screws, 6 casts and a moon boot!)…. still not at 100%, but so much better than being laid up on the couch waiting for others to feed me…..
Now I hope to be back on bento track…. I have 2 weeks of school holidays to get the bits and pieces sorted, do baking and cooking and start a habit…. While my holidays are busy, I hope to get my lunches sorted for good! 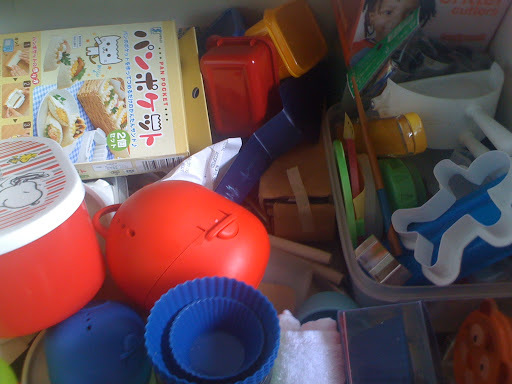 This morning I cleaned out my bento drawer…. and moved the overflow into the cupboard. This should make things much easier to find and get sorted. And yes- this is my definition of sorted! 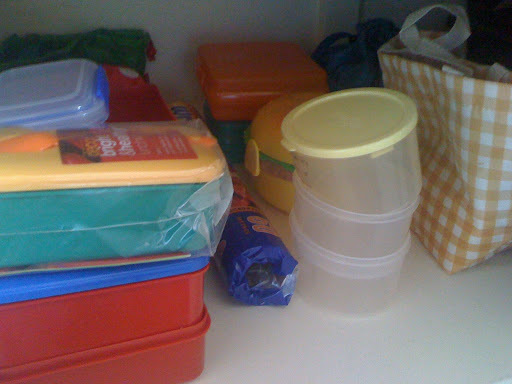 I have the bento’s and other larger containers in the cupboard, with small containers and bits and pieces in the drawer. The drawer- sort of chaotic, but at least I can now rummage for the small things. A friend of mine has chickens on her farm, and recently gave me a bunch of bantum eggs. These are currently boiling in preparation for tomorrow…. what will go with them….. I’m not sure yet… but the plan is in motion.